Paper Makeup Stamps: Sneak Peeks... new fairies! We hope you've enjoyed the sneak peeks so far! This month we are bringing you 3 new fairies! 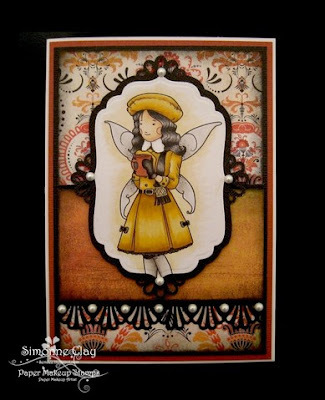 We will have a fairy in our card kit we are releasing this month, but you'll have to wait til Thursday to see that one! For today, we have 2 new Beautiful Day Fairies, illustrated by Diem Pascarella to show you! Also being released this month is Cosette! These are so gorgeous! I just love them. I gotta get out my PMS stamps, it's been awhile. The coloring is fantastic too. Beautiful coloring on the cards. Love the vintage style clothing on one of the fairies. Oh such wonderful additions to the fairies...these are beautiful!! Great creations from the DT - they are all so pretty! oh wow- these are both lovely. Diem has done it AGAIN!!! I am sooooooo bummed to miss the release party this month :(. The only good thing is I will be at a nutrition class so am getting to be a healthier me. However, I will miss hanging out with the PMS lovelies!! Beautiful cards and fairies. I'm just getting into the Copics. I've been using Prismamarkers or H2O color pencils and Gamasol in the past. oooo these fairies are adorable! I am digging the french feel, and I wish I could do that with my leg! I missed seeing these little beauties yesterday!! Great new fairies and gorgeous cards!! I have always loved fairy stamps and have a large collection. These are great and can't wait to add them. Cute fairies. The DT cards are great. I especially love the detail and sparkle to Lisa's card. The detail with the trail from her ice skate is perfect. The fairies are my favorites and Sasha is now on my list of favorite fairies. Great samples!